Definition of Roll Resistance “ the force resisting the motion when a body (such as a Castor or Wheel) rolls on a surface. 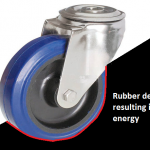 Generally a Castor Wheels low roll resistance is a positive attribute for a piece of equipment, providing ease of use for the operator, reduced user fatigue and reduce wear and stress of the equipment. However it should be noted that a high roll resistance may sometimes be preferable, for example to provide high grip and increased control of equipment. Friction is perhaps the main factor to consider when determining the Roll resistance of a Castor Wheel. Friction is the resistance between two surfaces sliding or rolling against each other. There are several types of friction, including Static, Sliding and Rolling Resistance. In this article we will be focusing on Rolling Friction which is most relevant to the Castor Wheel Industry. Based on the above simple equation it can be seen that by reducing the Coefficient of Friction of either the flooring or wheel material (or both), the resistance to move can be reduced. 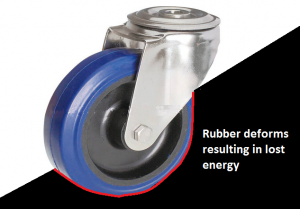 Rolling resistance of a Castor Wheel mounted machine or equipment is therefore the measure of the friction between floor surface and the tread of the Castors wheel. The “Resistance” is the amount of energy that is dissipated due to friction instead of being converted into movement of the equipment wheels. Therefore the lower the friction, the less energy absorbed, the more energy used to move the equipment. 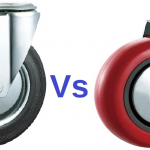 The Diameter of the Wheel also has a significant impact on the Castor Wheels roll resistance. The Larger the Wheel, the Lower the Roll Resistance, hence the easier to move. A wheel diameter of 100mm is twice as easy to move compared to a 50mm diameter wheel. Therefore it is always advised to use a bigger wheel as possible, within the height and cost constraints of the project design. Within the Material Handling Industry, Castors and Wheels are used to reduce the effort (force) required by the operator or user to move a piece of equipment or machinery. The amount of force required has a significant impact on the efficiency of the equipment hence the productivity. Secondly, reducing the force reduced user fatigue and ensures that equipment can be used for longer periods of time without falling foul of manual handling legislation. It is therefore important to consider a Castor Wheels Roll Resistance when designing equipment of selecting Castor Wheels. Another important factor to consider is the “Inertia” of the equipment. This is the initial force required for move a piece of equipment from a stationary position. The inertia force is always higher than the rolling force, as once momentum has started the force required to continue the motion is less. As a rule of thumb, the initial force to start movement is in the order of 2 to 3 times the rolling force. The Inertia of a piece of equipment can considerably change the amount of force needed to move an object. The Inertia is calculated based on the size and weight of the equipment. Imagine a 30Kg Box, 10cm x 10cm x 10cm, would be much easier to move or push, compared to a 30Kg Box, 100cm x 100cm x 100cm. Therefore not only the weight of the equipment but also the dimensional size of the equipment has a direct effect on the roll resistance due to inertia. 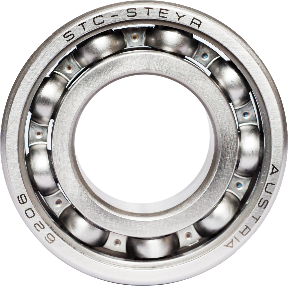 The bearing in the castor wheel axle can affect the roll resistance of the equipment (note: It does not affect the Inertia). Bearings act to reduce friction between the axle and the wheel. A Plain Bore Bearing Castor will have the axle rotating against the the bore of the wheel, increasing friction, whereas a Roller Bearing Castor Wheel will rotate the axle against the bearings and reduce the friction. It should be noted however that bearings have the least impact on roll resistance, with low friction roller bearings typically reducing total the coefficient of rolling friction by around 0.01. Therefore Wheel bearings should only be used in the most extreme scenarios, or where extended roll after removal of force is required. Consider the Wheel Tread Material Type. For example, Rubber tread for Low Noise &/or Floor Protection or Nylon for Wheel Wear Resistance. Choose the maximum possible wheel diameter. Choose a wheel with the required coefficient of roll resistance. Calculate the roll resistance (Consider initial force will be approx. 2 to 3 times higher).